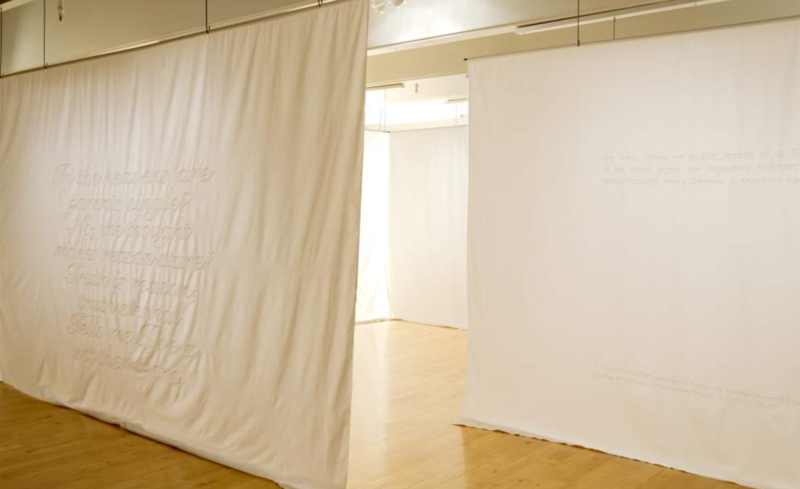 Katie West Payne‘s MFA thesis at BYU is called A Space for the Contemplation of a Sacred Silence and was recently exhibited at BYU (see a virtual tour below). Payne addresses the delicate subject of a Heavenly Mother in Mormon theology. 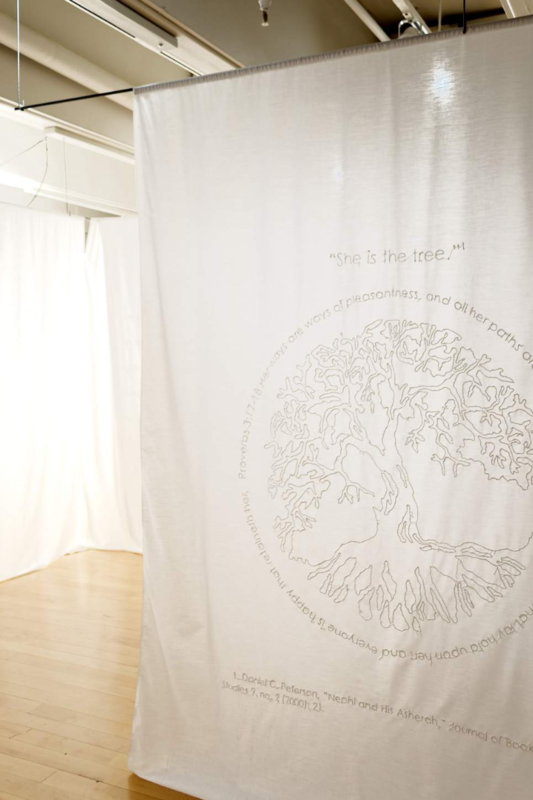 What has been the response to A Space for the Contemplation of a Sacred Silence? Initially, the response to the exhibit was slow. Not many people had heard about it so not many people came to see. Towards the end of the show’s run, the Salt Lake Tribune wrote an article. At that point, attendance picked up like mad. Many more people came to my closing reception than I had been expecting. The interest was overwhelming. The large majority of the responses I heard or read were positive. I will admit that some of the comments on the Salt Lake Tribune article were negative, but they were largely irrelevant. Everyone who left me a message after seeing my show seemed to have enjoyed the experience. I think watching people go through the maze was my favorite way to gauge what people thought. So many people seem to truly be moved by what they were learning. One strong memory that I have is of a young mother standing in front of one of the panels, holding her baby, and just weeping. She was not alone in that response. Why do you think the topic has become so taboo? I really don’t know why for sure. My best guess is that it was a combination of events in Church history (such as the excommunication of people working on women’s issues), folk-lore, and neglect of the topic by our Church leaders that made people uncomfortable talking about Heavenly Mother. The more important point is that it is starting to change. Through blogs and art and scholarship, Heavenly Mother is getting more and more attention. Instead of focusing on what went wrong, I think it is important to forward the work. It is a topic that is near to my heart, and the hearts of so many others. By continuing to celebrate Her, we will make even more change, until there is no taboo at all. How do you feel gender issues are changing at BYU and in the Church? Change in both the Church and BYU happens slowly. But we must admit that we have seen some positive changes in the recent past. Women can now pray in General Conference, the age for women to serve missions has been changed, and women with children can now teach seminary full time. These changes, however, are only the beginning. In many respects, we still must look to Joseph Smith and the early sisters of the Relief Society for an adequate goal. There was a vision for women, even back then, that we have since lost sight of. If women are to find their rightful place in the kingdom of God, they must remember what has been forgotten. A large part of my show was trying to help both men and women remember. If we can remember our heritage, we can then begin to move forward. Do you think the art community within the church is evolving? I would have to say that it is evolving. I am most familiar with what is happening at BYU, so I will tell a little about why I think that the art world in BYU is changing. I had wonderful professors at BYU who were very supportive of my work about Heavenly Mother, but even still, we spent a lot of time wondering whether my show would be forced to end early. This had happened before, with shows that were even less controversial. We made lots of little decisions and changes to try and minimize the chance that someone would see something that they would find offensive. That we had to worry about this means there is still a great deal of control exerted over students’ work. Yet, that fact that I did not hear of a single complaint suggests that maybe BYU underestimates the ability that its students have to deal with controversial topics. All the responses to my show were thoughtful and mature. This tells me that BYU–and Church membership in general–is more than prepared to handle the complex topics that Mormonism has to offer. What’s your next art project? I am really excited about my next project! I am doing a series of drawings about the wives of Joseph Smith. There will be one autobiographical drawing for each wife covered in the book In Sacred Loneliness: The Plural Wives of Joseph Smith by Todd Compton. I am also thinking about doing a special drawing for Emma, who was not covered in the book. The drawings are small, only 10 x 10 inches, but each one conveys a lot of information. I have come up with a system of symbols that tells specific details about the women’s lives. My hope is to convey the beauty, strength, and complex nature of their lives. I am working with the director of Writ and Vision in Provo to display the project sometime in July, if all goes well. Images courtesy Katie West Payne/Salt Lake Tribune. Visit Katie West Payne’s website. Follow Katie West Payne on Instagram. The Krakens is a digital gallery featuring art and design created by Mormon artists. I feel there is enormous talent among the Mormon art community, but it is largely hidden from public view and acclaim. As I began to discuss this lack of “community” with some of my artist friends they agreed that there was no good venue for finding new Mormon artists, and thus The Krakens was born. Like the great sea monster that slumbers under the ocean, I hope this community of Mormon artists will emerge with talented tentacles stretching across varied mediums and numerous countries. This website is meant to showcase, educate, and connect the culture. The Krakens will focus on design, fine art, illustration, photography, sculpture, video, and other beautiful things. Because we intend this website to be viewed by an audience that includes students, we will not be posting things that are insensitive or inappropriate for our audience. While we appreciate many forms of art, this will not be a gallery for everything. Artists do not need to be active or supportive of the Church, but all artists must have shared in the cultural Mormon heritage at some point in their life. Just to be clear, this is not an official website of The Church of Jesus Christ of Latter-day Saints. Orson F. Whitney once said, “We will yet have Miltons and Shakespeares of our own.” I hope this website will help in developing and championing the Mormon artistic community.